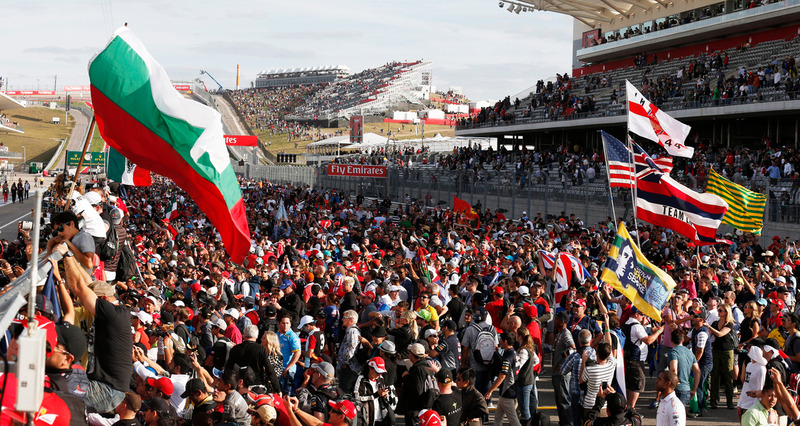 Circuit of The Americas is a world-class destination for premium sports and entertainment. It is the first purpose-built Formula 1™ facility in the United States designed for any and all classes of racing, from motor power to human power, and is home to the FORMULA 1 UNITED STATES GRAND PRIX while also hosting MotoGP™, the FIA World Endurance Championship, the Tudor United SportsCar Championship and the Summer Edition of ESPN’S X Games. Circuit of The Americas produces many promotional and marketing materials that describe the company’s programs to various audiences. Because these materials convey our image and message to millions of people, maintaining high standards of accuracy and consistency in editorial copy is essential to exhibiting the consistent image of the company. Austin360 Amphitheater: “Austin360” is the official name of the amphitheater and should always be included when referencing the live music venue. Back Straight: “Back Straight” should be in Title Case when referencing the track portion between Turns 11 and 12. Circuit of The Americas: “The” is capitalized in the venue name while “of” is lowercase. May also be referred to as the “Circuit” or abbreviated as “COTA.” Note: that abbreviation is written in all caps and is pronounced [koh-tuh]. Grand Plaza: The “Grand Plaza” should be in Title Case when referencing the venue space. Main Grandstand: “Main Grandstand” should be in Title Case when referencing this seating area at the venue. Stadium Section: “Stadium Section” should be in Title Case when referencing the track portion from Turns 12 through 15. Velocity Lounge: The “Velocity Lounge” should be in Title Case when referencing this hospitality area. Dorna Sports: The company that looks after the exclusive commercial and television rights for the FIM RoadRacing World Championship Grand Prix (MotoGP™) series. May be referred to as “Dorna.” The company is run by CEO Carmelo Ezpeleta. Formula 1™ and F1™: Formula 1™ and F1™ are the brands used to identify the world’s prestigious motor racing championship. These terms are registered trademarks. Use in titles, headers etc. should be followed by the symbol ™. In editorial copy (e.g. body of text, news and race reports), they should be written in Title Case or ALL CAPS to identify use of a trade mark but the “TM” symbol is not mandatory. The event name must be written in ALL CAPS, (e.g. [YEAR] FORMULA 1 UNITED STATES GRAND PRIX). NOTE: Formula 1™ and F1™ should not be used as nouns; they should be used to modify a noun for example “Formula 1™ driver,” “F1™ racing.” They should never be used in the possessive form. For example, “FORMULA 1’s cars” is not recommended. Formula One group: The Formula One group describes the group of companies which together hold, manage and exploit the exclusive commercial rights in, of or pertaining to the FIA Formula One World Championship™, including the right to commercially exploit the Formula 1® and F1® brands worldwide. Formula One Management Limited: Formula One Management Limited, or “FOM,” is one of the key companies within the Formula One group, headed by Bernie Ecclestone. It operates as business and administrative manager of the group companies, including the commercial rights holder. International Motor Sports Association: The sanctioning body for the U.S.-based United SportsCar Championship, which debuted in 2014. Can be abbreviated as “IMSA” on second reference. MotoGP™: The series name should be written as such and followed by the ™ symbol. Moto2™ and Moto3™ are the other classes of motorcycle road racing taking place during a MotoGP event. FIA World Endurance Championship: The series name may be preceded by FIA but it is not mandatory. The series may be abbreviated as “WEC.” The event name should be referred to as announced by the Circuit each season (e.g. “6 Hours of Circuit of The Americas”). This section is designed to provide definitions for general motorsport circuit terms with an emphasis on terminology used in Formula 1 racing. Standard grammar and punctuation rules apply unless otherwise noted. A complete glossary of Formula 1-related terms can be found at http://www.formula1.com/inside_f1/glossary. Apex: The middle point of the inside line around a corner at which drivers aim their cars. Chicane: A tight sequence of corners heading in alternate directions. Usually inserted into a circuit to slow the cars, often just before what had been a high-speed corner. In the case of Circuit of The Americas, chicanes exist at Turns 12 through 15. Cockpit: The section of the race car chassis in which the driver sits. Degradation: A term used to describe the process by which a tire/tyre loses performance or grip. Different from tire/tyre wear, which concerns the process by which the tread is worn away. Downforce: The aerodynamic force that is applied in a downward direction as a car travels forward. This is harnessed to improve a car's traction and its handling through corners. Drag: The aerodynamic resistance experienced as a car travels forward. Drive-through penalty: One of two penalties that can be handed out at the discretion of the stewards while the race is still running. Drivers must enter the pit lane, drive through it complying with the speed limit, and re-join the race without stopping. DRS: Also known as adjustable rear wings, DRS (Drag Reduction System) rear wings allow the driver to adjust the wing between two pre-determined settings from the cockpit. The system's availability is electronically governed; it can be used at any time in practice and qualifying (unless a driver is on wet-weather tires). During the race can only be activated when a driver is less than one second behind another car at pre-determined points on the track. The system is then deactivated once the driver brakes. In combination with KERS, it is designed to boost overtaking. The DRS zone at Circuit of The Americas is located between Turns 11 and 12 and along the main straight. Formulation Lap: The final lap before the start of the race, during which the cars are waved away from the grid and then warm up their tires and brakes. G-force: A physical force equivalent to one unit of gravity that is multiplied during rapid changes of direction or velocity. Drivers experience severe G-forces as they corner, accelerate and brake. Graining: When a car slides, it can cause little bits of rubber or “grains” to break away from the tire’s/tyre’s grooves. These then stick to the tread of the tire/tyre, effectively separating the tire/tyre from the track surface very slightly. For the driver, the effect is like driving on ball bearings. Careful driving can clear the graining within a few laps, but will obviously have an effect on the driver’s pace. Driving style, track conditions, car set-up, fuel load and the tire/tyre itself all play a role in graining. In essence, the more the tire/tyre moves or slides about on the track surface, the more likely graining is. Grip: The amount of traction a car has at any given point, affecting how easy it is for the driver to keep control through corners. Handling: A term used to describe a car’s responsiveness to driver input and its ability to negotiate corners effectively. A car that handles well will typically be well-balanced and not understeer or oversteer to any great degree. HANS Device: Short for Head and Neck Support Device, a mandatory safety device that fits over the driver’s shoulders and connects to the back of the helmet to prevent excessive head and neck movement in an accident. Headrest: The removable energy-absorbing foam that surrounds the driver’s helmet in the cockpit. Three different grades of foam are used, depending on the ambient temperature. KERS: Legal since 2009, Kinetic Energy Recovery Systems, or KERS, recover waste kinetic energy from the car during braking, store that energy and then make it available to propel the car. The driver has access to the additional power for limited periods per lap, via a “boost button” on the steering wheel. Kevlar: A synthetic fiber that is combined with epoxy resin to create a strong, lightweight composite used in F1 car construction. Lock-up: The term used to describe a driver braking sharply and “locking” one or more tires/tyres while the others continue rotating. Tire/tyre smoke and flat spots are common side effects. Lollipop: The sign on a stick held in front of the car during a pit stop to inform the driver to apply the brakes and then to engage first gear prior to the car being lowered from its jacks. Marbles: The small pieces of tire/tyre rubber that accumulate at the side of the track off the racing line. Typically these are very slippery when driven on. Marshal: A course official who oversees the safe running of the race. Marshals have several roles to fill, including observing the spectators to ensure they do not endanger themselves or the competitors, acting as fire wardens, helping to remove stranded cars/drivers from the track and using waving flags to signal the condition of the track to drivers. Main Straight: Refers to the start/finish portion of the track. It should be written in Title Case. In the case of Circuit of The Americas, the Main Straight is located between Turn 20 and Turn 1. Monocoque: The single-piece tub in which the cockpit is located in a Formula 1 race car, with the engine fixed behind it and the front suspension on either side at the front. Nomex®: An artificial, fire-resistant fiber used to make drivers’ race overalls, underwear, gloves and boots. Option tire/tyre: The second and usually softer of the two tire/tyre compounds nominated by the official tire/tyre supplier for use at each Formula 1 Grand Prix. Not expected in theory to be as well suited as the prime tire/tyre to that particular circuit’s characteristics, but may provide certain advantages in terms of pace or durability. Oversteer: When a car’s rear end doesn’t want to go around a corner and tries to overtake the front end as the driver turns in toward the apex. This often requires opposite-lock to correct, whereby the driver turns the front wheels into the skid. Paddock: An enclosed area behind the pits in which the teams keep their transporters and motor homes. The general public is not admitted to this area during Formula 1 events, but open access is common during U.S.-based motorsport events. During Formula 1 event, paddock access requires a paddock pass, and passes are limited to working personnel, drivers, media and sponsors’ guests. Parc ferme: A restricted area into which cars are driven after Formula 1 qualifying sessions and the Grand Prix race, where no team members are allowed to touch them except under the strict supervision of race stewards. Pit board: A board held out on the pit wall to inform a driver of his race position, the time interval to the car ahead or the one behind, plus the number of laps of the race remaining. Pits or Pit Lane: An area of track separated from the start/finish straight by a wall, where the cars are brought for new tires and fuel during the race, or for set-up changes in practice, each stopping at their respective pit garages. Pit Wall: Where the team owner, managers and engineers spend the race, usually under an awning to keep sun and rain off of their viewing monitors. Pole position: The first place on the starting grid, as awarded to the driver who recorded the fastest lap time in qualifying. Practice: The periods on Friday and on Saturday morning at a Formula 1 Grand Prix when the drivers are out on the track working on the set-up of their cars in preparation for qualifying and the race. Prime tire/tyre: Of the two tire/tyre compounds nominated by the official tire/tyre supplier for use at each Formula 1 Grand Prix, the prime is the compound that is in theory best suited to that particular circuit's characteristics. Normally harder than the option tire/tyre. Protest: An action lodged by a team when it considers that another team or competitor has transgressed the rules. Qualifying: The knock-out session on Saturday during three-day a Formula 1 event in which the drivers compete to set the best time they can in order to determine the starting grid for the race. R&D: Short for Research and Development, the term describes activities undertaken by a team to develop or improve a system or component. Racing Line: The theoretical best line around the racetrack for the perfect lap. This is not necessarily the shortest distance, but rather one that involves the smoothest turns around each corner so that they may be taken at the highest possible speed. Safety Car: The course vehicle that is called from the pits to run in front of the leading car in the race in the event of a problem that requires the cars to be slowed. Scrutineering: The technical checking of cars by the officials to ensure that none are outside the regulations. Sectors: For timing purposes the lap is split into three sections, each of which is roughly a third of the lap. These sections are officially known as Sector 1, Sector 2 and Sector 3. Slipstreaming: A driving tactic when a driver is able to catch the car ahead and duck in behind its rear wing to benefit from a reduction in drag over its body and hopefully be able to achieve a superior maximum speed to slingshot past before the next corner. Steward: One of three high-ranking officials at each Formula 1 Grand Prix appointed to make decisions. Stop-go penalty: A penalty given that involves the driver calling at his pit and stopping for 10 seconds with no refueling or tire/tyre-changing allowed. Tires or Tyres: “Tyre” is the preferred spelling of “tire” in most varieties of English outside North America. Both spellings are defined as “a covering for a wheel, usually made of rubber” and are interchangeable. “Tire” is acceptable for use in U.S. communications and publications. Telemetry: A system that beams data related to the engine and chassis to computers in the pit garage so that engineers can monitor that car’s behavior. Torque: Literally, the turning or twisting force of an engine, torque is generally used as a measure of an engine's flexibility. An engine may be very powerful, but if it has little torque that power may only be available over a limited rev range, making it of limited use to the driver. An engine with more torque, even if it has less power, may actually prove quicker on many tracks, as the power is available over a far wider rev range and hence more accessible. Good torque is particularly vital on circuits with a number of mid- to slow-speed turns, where acceleration out of the corners is essential to a good lap time. Traction: The degree to which a car is able to transfer its power onto the track surface for forward progress. Tub: Another name for the chassis or monocoque, so called because of its shape. Turbulence: The result of the disruption of airflow caused by an interruption to its passage, such as when it hits a rear wing and its horizontal flow is spoiled. Tire/tyre compound: The type of rubber mix used in the construction of a tire/tyre, ranging from soft through medium to hard, with each offering a different performance and wear characteristic. Tire/tyre warmer: An electric blanket that is wrapped around the tires/tyres before they are fitted to the car so that they will start closer to their optimum operating temperature. Understeer: Where the front end of the car doesn't want to turn into a corner and slides wide as the driver tries to turn in towards the apex.